Dr. Moshe J. Bernstein is Professor of Bible and Jewish History and the David A. and Fannie M. Denenberg Chair in Biblical Studies. 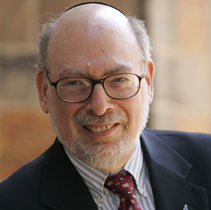 He received his BA in Classical Languages from Yeshiva College (’66), his MHL in Semitics from Revel (’69), Smicha from RIETS (’69), and MA and PhD degrees in Classical Languages from Fordham University. He then did further graduate work in Bible at Revel. Dr. Bernstein “literally grew up in YU,” on the corner of 186th and Laurel Hill, and he remembers running around what is now Zysman Hall as a small child. His father zt”l was a RIETS Rosh Yeshiva and YU professor. After completing his graduate work at Fordham, Dr. Bernstein taught Classics at the University of Illinois in Chicago. He returned to YU in 1977 to continue his graduate studies at Revel, and has been a member of the YU Jewish Studies faculty since 1978. Additionally, Dr. Bernstein has taught in the graduate program in NYU’s Skirball Department of Hebrew and Judaic Studies for over a decade and has been a member of the International Editorial Team for the Dead Sea Scrolls. He just celebrated his 50th reunion with the class of 1966. Aside from the actual teaching and the production of research scholarship (which you’ve got to love if you’re going to be a college teacher), I particularly relish the opportunity furnished by the fields I teach to encourage students to understand fully the integrated mission of the Yeshiva and the University, an activity that takes place as much outside of the classroom as in it. I knew that I was going to be an educator, since that was, so to speak, the family profession, and I sensed fairly early that I wanted to teach on the college level. What books in Tanach do you enjoy teaching most and why? In the Torah, I have an affinity for the book of Bemidbar, which depicts the transition between the generation of the Exodus and the generation of the Conquest. Elsewhere, I love teaching Tehillim, showing the relationship between its literary artistry and theological meaning; Qohelet which demands of its reader to think; Eichah which demonstrates that confronting God harshly in times of crisis is part of our tradition; and Ruth because it is such a polished literary work that is full of meaning. I believe that students have a lifetime right to call upon their teachers, although not all students choose to exercise that right. In past years, we’ve hosted students for Shabbat and held annual barbeques for alumni and their families. My office door remains open not just to current students, and my email address and phone number are not secret. I remain connected with many former students, especially the ones who are Jewish educators or Jewish academicians, many of whom I’ve mentored, and, of course, the substantial number who belong to Congregation Rinat Yisrael in Teaneck, as I do. What would your colleagues and students be surprised to learn about you? I was a fairly successful tournament bridge player for several years in the 1970’s.